First erected on St. Lambert Square by Notger 1000 years ago, the original palace was destroyed by a fire in 1185. It was immediately reconstructed by Rudolf von Zähringen (1135-1191), Prince-Bishop of Liège and Bishop of Mainz. This second palace was heavily damaged in 1468, during the plunder of the city by the troops of the Duke of Burgundy, Charles the Bold. The Palace was rebuilt again in 1526 by Erard of La Marck. He commissioned architect Arnold van Mulchen for the work, who also built the St. Martin Basilica and St. James Church (see below). The reconstruction, combing elements of Gothic and Italian Rennaissance, was only completed at the end of the century. The greater court is enclosed by 60 columns with richly ornated capitals, each with their own unique patterns. Note the buffoons, grimacing masks or other typical Renaissance figures. Another fire ravaged the southern (main) façade in 1734. 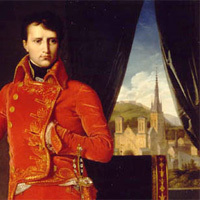 Jean-André Anneessens was appointed to revamp the ruined section, which he designed in the French Regency style of the time. In 1849, when the provincial government moved in, a new western wing was added by architect Jean-Charles Delsaux, in the same style as the rest of the palace. Victor Hugo (1802-1885) wrote about the palace's inner court "Nowhere have I seen a construction so remarkable, serious and grandiose at the same time". 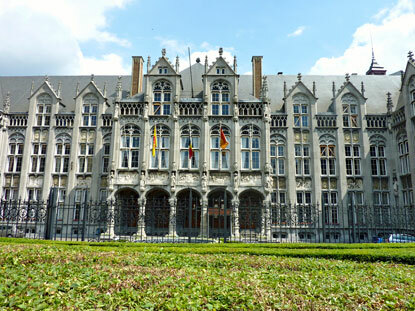 Nowadays, the palace still houses parts of the provincial government as well as the courts of justice of the city of Liège. It is only open to visitors exceptionally, or by appointment (information at the Tourist Information Centre, on Féronstrée, 92 ; tel. 04.221.92.21). 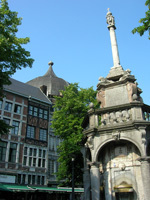 Until the French Revolution, the Cathedral of Our Lady-and-Saint-Lambert of Liège stood opposite the palace, in what is now the vast St Lambert Square. It was one of the largest cathedral in Northern Europe, but was demolished by the revolutionaries in 1794. Built on the spot where Saint Lambert, Bishop of Tongeren & Maastricht, was assassinated in 705, the site was first a Martyrium, soon followed by a first cathedral at the end of the 8th century. Notger erected a great Ottonian-style edifice, where he installed 60 canon priests. One of the particularities of that church is that the entrance was on the sides, rather than in the axis of the quire. In April 1185, the same fire that destroyed the palace (which originated in a house adjacent to the cloister) left the cathedral in ruins. A new Gothic cathedral was already consecrated in 1189, although the whole edifice was not completed until 1433, when a clocktower was added, culminating at 134.5 meters (441 ft), like the hill where the citadel once stood. The new cathedral was 96-meter long (170m if we include the cloisters). With the side chapels, its width was 37 meters. Its dimensions were thus similar to Notre-Dame de Paris (130 meters in length on 48 meters in width). If it still stood today, the cathedral of Liège would be the tallest in Belgium and 9th tallest in the world. During the anti-clerical movement of the French Revolution, it was decided that the cathedral of Liège symbolised the power of the prince-bishops, and thus of the old feudal regime, and had to be razed. The palace had a more fortunate fate. The destruction of the religious institution started in 1794, but the towers were not pulled down until 1803, and the grounds levelled in 1827. 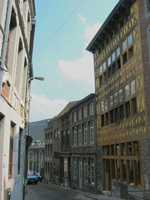 Saint Lambert Square is now home of the Archeoforum of Liège, the largest of its kind in Europe. It is the result of nearly a century of excavations on the site of the old St. Lambert's Cathedral. Exhibits include artifacts and explanations related to the various cathedrals built on the spot through the ages, but also of an earlier Gallo-Roman villa, and even Neolithic and Paleolithic objects. The archeoforum is open all year round from 10 am to 6 pm (closed on Mondays, 25 December and 1 January). There are guided tours in five languages (English, French, Dutch, German and Spanish) every hour from 10 am to 5 pm. Admission is 5.5 € (various discounts for students, families, or groups). 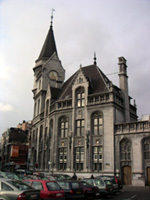 The Treasure of the Cathedral of Liège can be visited in a museum located at 6, Rue Bonne-Fortune, behind Saint Paul Cathedral. Combined tickets are available for the museum and archeoforum. Rue Hors-Château was a medieval extension outside the city walls starting from the north-eastern corner of the palace. The street parallel to it to the south is Feronstrée (from the French word ferronerie - the former ironworks street). This neighbourhood, which boasts no less than 5 museums and 3 notable churches, has a lot a nicely renovated 17th and 18th-century townhouses, as well as quaint narrow streets and blind alleys, with more modest, but quite pretty houses. The Tourist Information Centre is located at Feronstrée, 92. At the beginning of Rue Hors-Château stands the Baroque-style St. Anthony's Church (église Saint-Antoine), built by the Jesuits in 1645. A bit farther, the Museum of Religious Art and Mosan Art (Musée d'Art religieux et d'Art mosan) , at the corner of Rue Mère-Dieu, houses the scale model of the old St. Lambert's Cathedral and various objects that once belonged to it. Turn at the next corner on the left side of the road to reach the 400 steps of the so-called mountain of Bueren (escalier de la montagne de Bueren), leading to a lookout at the top of the hill. The stairs were built in 1880 to allow the soldiers of the barracks on top to reach the city more quickly. It earns its name from Vincent of Bueren, the leader of the 600 Franchimontois, who heroically tried to climb the hill to kill Charles the Bold, Duke of Burgundy, who was assailing the city (but they failed). Take the narrow Rue des Ursulines, which leads to an old beguinage and a panorama. Back on Rue Hors-Château, the Church of Our Lady of the Immaculate Conception (église Notre-Dame-de-l'Immaculée-Conception), like St. Anthony, is another Baroque edifice (built in 1655), but with a red façade. Toward the end of the street, St. Bartholomew's Collegiate Church (collégiale Saint-Bathélemy) is one of the oldest building in Liège. It was completed in 1015, in Mosan Romanesque style reminiscent of Our Lady's Basilica in nearby Maastricht. It has recently been repainted in red and white. The interior was redecorated in the 18th century. Do not miss the baptismal font made by Renier of Huy in the 12th century. This masterpiece of medieval art is one of the best-known baptismal font in the world. A professor of the University of Liège has even written an entire book dedicated to it. 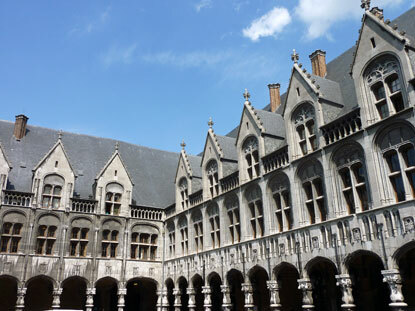 Across St. Bartholomew's Square is the new Grand Curtius Museum (open 10 am to 6 pm every day except Tuesday ; entry € 9). It re-opened in March 2009 after several years of renovation to accommodate the collections of the former Museum of Walloon Life, Arms Museum, Glass Museum, and the old Curtius Museum itself. It is now the largest museum in Wallonia (10,000 m2), featuring over 5200 items displayed in chronological or thematic order. Its collections are divided into six sections : Archeology, Religious & Mosan Art, Arms & Weapons, Decorative Arts, Glass and the privately donated Baron Duesberg collection (18th- and 19th-century decorative arts). The archeology section goes back 7000 years and includes Egyptian sarcophagi, Neolithic objects, and artefacts (e.g. seals, coins and medals) from the Gallo-Roman and Merovingian periods. The Arms section reminds the visitors of Liège's long history in arms making. Rich of 11,000 items, it is the second largest arms collection in Europe. 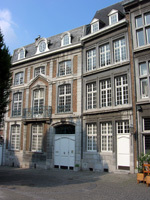 The Museum of Walloon Art is also housed at the same address. 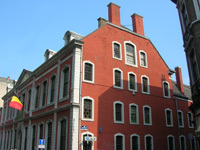 The 17th-century building of the Grand Curtius is a former weapon factory. It is a grand, imposing edifice in typical Mosan style and is well worth a look in itself even if you don't intend to visit the museum. At number 114 on Feronstrée, the small Ansembourg Museum, a stately home built for a merchant-banker between 1738 and 1741. The house was later acquired by the Counts of Ansembourg (of which it kept the name), then other families. 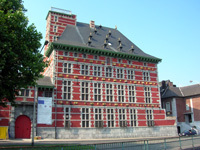 In 1903, the City of Liège purchased it with the purpose of creating a museum dedicated to the 18th-century decorative arts from Liège, which opened in 1905. Everything inside is richly decorated, from painted ceilings with stucco overmantels, the chandeliers, the furniture, the 17th-century tapestries from Oudenaarde, the Baroque fireplaces, the original 17th and 18th-century books and engraving, and the potraits, including one of Prince-Bishop Joseph Clemens of Bavaria. 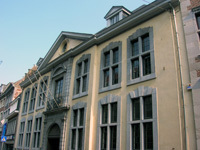 At number 86, the Museum of Walloon Art (Musée de l'Art wallon) has a collection of paintings and sculptures by Walloon artists, displayed in a chronological order from the 16th to 20th century. It includes works by Constantin Meunier, Paul Delvaux, and René Magritte.